Momma Told Me: Children should be seen and not heard. For decades the pastime of pretending to be an International Spy has been high atop kids pretend play lists, right alongside cops and robbers. Of course when I was child this meant penny 'decoder' rings and faulty disappearing ink. My friends and I would invent our own coded language to transmit secret notes, and hide out in our parents' closets trying to catch a glimpse of where the Christmas gifts would be hidden. Even in the 80s and 90s, James Bond inspired concepts were still very much a whimsical notion- the most advanced secret gear I owned was an Ajax can with a removable bottom, or a periscoping ballpoint pen. Today modern technology has turned the technology of our dreams into a reality, with the most recent release of the spy inspired Galaxy Gear watch. And, with more and more kids glued to smartphones and tablets every day, I'm especially enamored with brands, like Spin Master Toys, that continue to foster imaginative play with a creative mix of modern technology and simplistic execution. You may recall, a few weeks back, I featured the Spy Gear Sonic Distractors; two lightweight plastic balls that could be rolled, tossed, and stashed to trigger one of 8 programmable sounds. 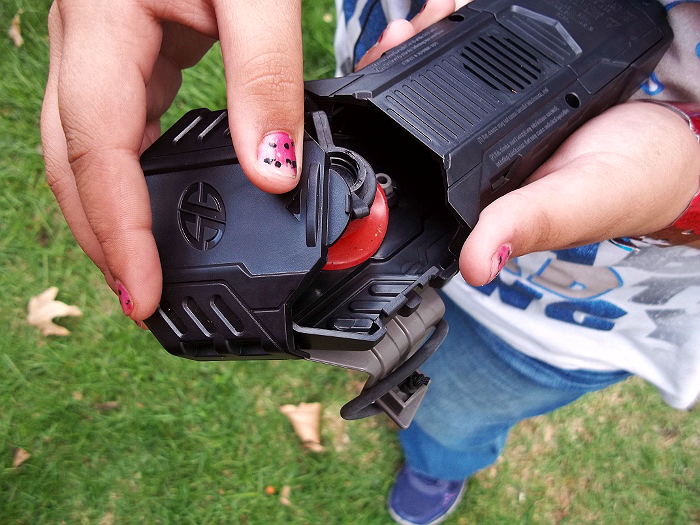 While this was agreeably an outdoor toy, for it's sheer volume, it was a big hit with Sabrina (11), who often fanciers herself a bit of a jack-of-all-trades (despite being the klutziest child I know). While she is far from stealthy, these imaginative Spy Gear toys actually encourage coordination and spacial awareness; after all, a spy can't be crashing through the front door, right? 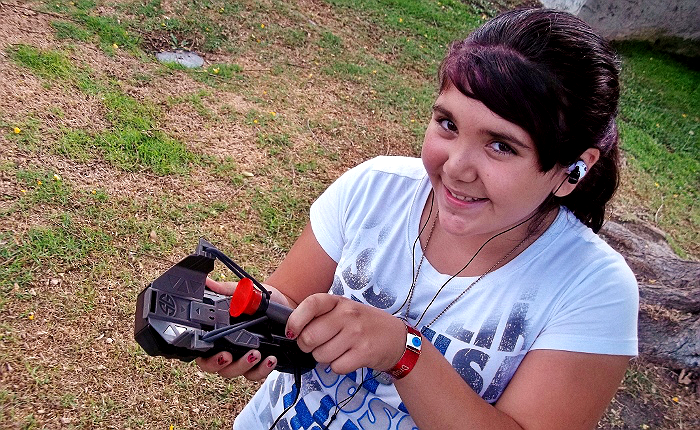 So, when I pulled out the Spike Mic Launcher, I knew Sabrina was going to be blown away. Heck, I was even intrigued by the concept. The Spike Mic Launcher is a bit more advanced than the Sonic Distractors, requiring the installation of 4 AAA batteries, and a suggested age of 10+. This somewhat bulky contraption consists of one recording mic, which is actually more of a transmitter than a recorder, and one slingshot style handheld unit that also acts as the dart's charger and audio transmitter. 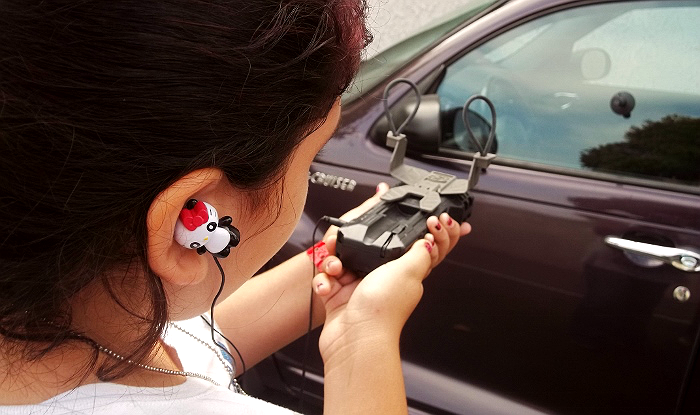 That's right, this nifty Spy Gear toy launches a dart and transmits up to 10 minutes of audio to it's listener up to 30 feet away! Of course, we found the actual transmitting time to average 7 minutes, and the best (clarity) distance to be about 20 feet (with little to no obstructions). 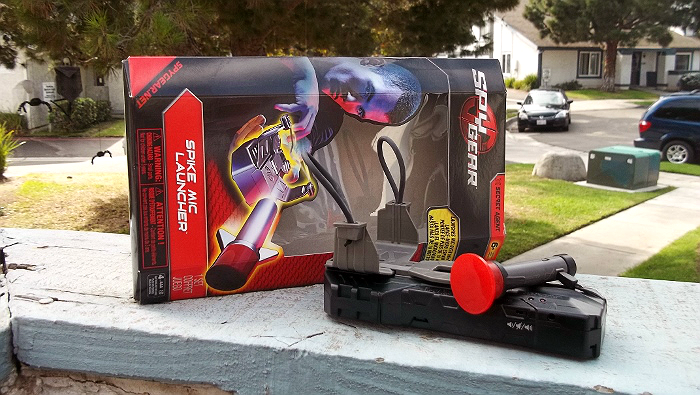 The Spike Mic LAuncher includes everything you need except for basic jack headseats and 4 AAA batteries. As toys like this go, the batteries can be drained fast as kids recharge the dart over and over, so invest in some rechargeables if you can. Also, if you are giving this as a gift you may wish to open it ahead of time and pre-charge the dart, as each charging session will run about 20 minutes. Charging is done through a feed out cable on the base. 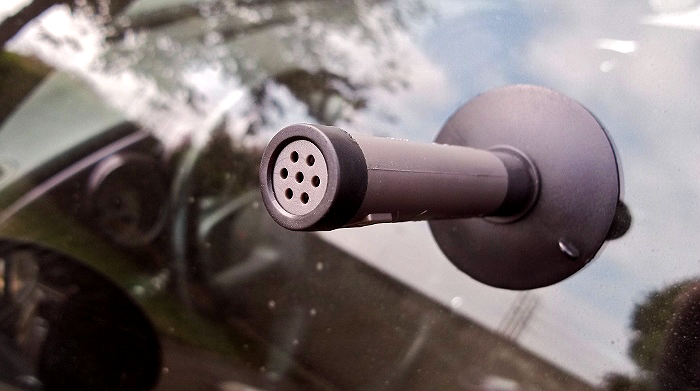 The Spike Mic Launcher includes 1 dart, with 2 interchangeable tips, which screw on/off, one for smooth window/glass surfaces, and another which is sticky for walls. The sticky, red, tip dart is made of a common material kids often get out of quarter machines that sticks to walls- but tends to get completely filthy with lint and debris in a matter of no time. 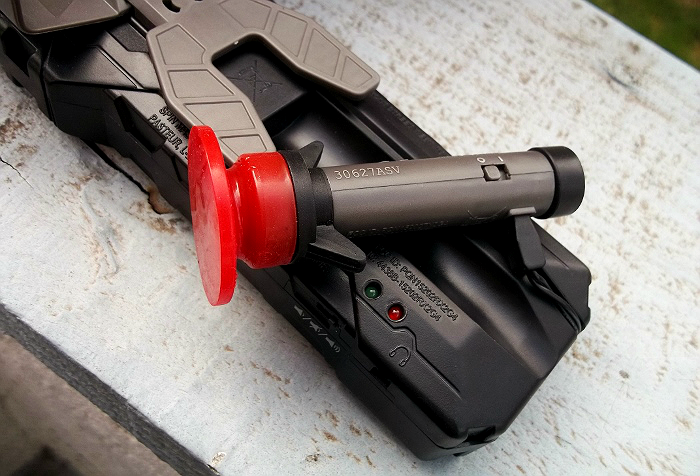 There is a compartment underneath the handheld unit that stores your dart tip when not in use. One of the first things we noticed was that the suction tip does not have notches for launching, and is intended to be placed by hand on various surfaces (beneath tables, vanity mirrors, etc). Sabrina (11) also had some difficulty getting the sticky dart to launch accurately from the slingshot, as the rubber bands are a bit stiff and the notches on the dart tip are a bit short. Outside of these minor notes, with a price point around $20, this was a wonderful toy to foster imaginative play. Both of us were impressed with the clarity of the audio transmission, and the ability to adjust the volume via a simple toggle on the handheld unit. Now, as an adult, you might be worried kids will be using this toy for all sorts of covert snooping they should otherwise not be partaking in. Rest assured (especially indoors and with walls) you would most certainly see your should crouched around the corner trying to listen in. The transmission range simply isn't that far for actual spy work; but the concept is fun for all ages and executed brilliantly! The Spy Gear line of toys, from Spin Master, is sold nationwide at toy retailers, and online at Amazon.com. 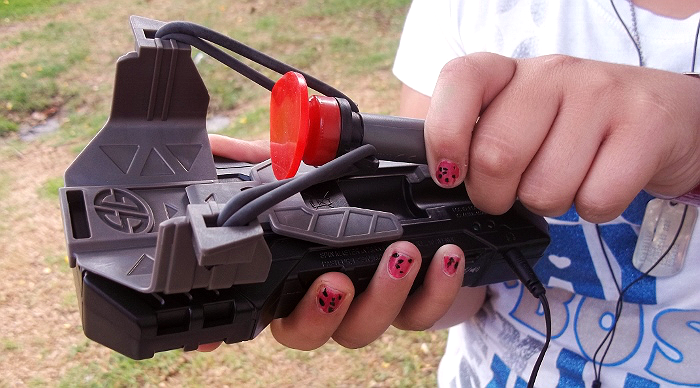 What Daughter Says: Rest assured, with the Spike Mic Launcher children will hear AND be seen. One Momma Told Me reader will win a Spy Gear Spike Mic Launcher and Sonic Destractors bundle! What fun - I can envision all manner of secret agent doings in the neighborhood. Spy vs. Spy? How much fun! This toys looks so gray!! This is so cool. I'm showing it to my daughter for her gift list. I think she'll love it! This looks like fun, and it's great to see a toy that gets kids to play outside, instead of locked up inside the house all day! Oooh, I love spy and mystery type stuff. This looks like a lot of fun! Oh how fun. I could see Joey having a ball with it. Shoot, my husband would love this! Zoomer the robot dog looks fun! My niece would love Runaway Vacay! My Boys would love the Tenkai Knights Toys. The Action Packs would give them a good start. I like the Valorn, Bravenwolf, Guardian Pack. My son would also like the Spy Gear - Ultimate Night Vision.